In the mid-20th century, Catholic high school students were typically required to attend a retreat before graduation, and those attending schools run by Christian Brothers were no exception. The religious community ran several all-male Twin Cities schools, most of which have since merged or closed: Archbishop Brady High School in West St. Paul, Benilde High School in St. Louis Park, Cretin High School in St. Paul, DeLaSalle in Minneapolis, Hill High School in Maplewood and Archbishop Grace High School in Fridley. By the 1950s, the Christian Brothers in the Twin Cities were searching for a place to establish a retreat center like the ones they ran in Chicago and St. Louis. In 1958, they responded to an advertisement in the Catholic Bulletin, The Catholic Spirit’s forerunner, listing the Dunrovin property for sale. They purchased the property and broke ground on a retreat center in April 1963. The first retreat was held in 1964 on Ash Wednesday for Hill High. Four months later, Archbishop Leo Binz formally blessed the center and grounds. Prior to its purchase by the Christian brothers, the property was operated in the 1930s as Morning Glory Trout and Game Preserve. Located along the St. Croix River 10 miles north of Stillwater, it “was known as a place where businessmen could get away from the city, fish in the trout pond, board their dogs and enjoy the great outdoors,” according to a history provided by Dunrovin. R.M. Hadrath, founder of the Twin Cities-based food powder processing business Maple Island, acquired the preserve by the 1940s for a country home. According to local legend, the name sprung from Mrs. Hadrath’s tiring of the family’s frequent travels. When they eventually made the property their permanent home, she said she was “done roving,” and the named turned into “Dunrovin.” They asked the Christian Brothers to keep it. Dunrovin hit its stride as the popular retreat structure was in flux. 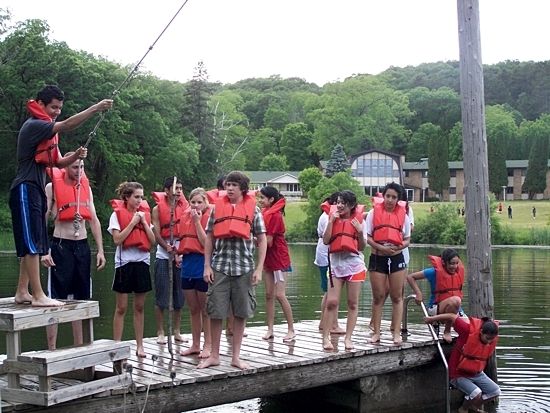 Once silent affairs filled with lectures, retreats began to include more activities. The retreat center suffered, however, with the merger and closing of several Catholic schools and the end of a requirement for senior retreats, said Christian Brother Bill Clarey, who directed Dunrovin in the late 1960s. When Jerome Meeds joined the staff with a background in Catholic camps, he saw an opportunity to revitalize and broaden the programing, he said. Today, Dunrovin hosts guests most weekends and is seeking to bring in more guests on weekdays.